In the attempt to present a life on film, there will always be parts that are left out. The camera cannot capture every minute detail of a person’s life, and that’s an understanding audiences will usually approach with. Where biopics may attempt to cram in all the information necessary, documentaries rarely try; they aim to capture real life without truncating events to fit a neat runtime, but rather honing in a moment and building a story out from there. The documentary as celebration of a milestone means that the viewer can reminisce and engage with the subject in a contemplative and intrigued manner. 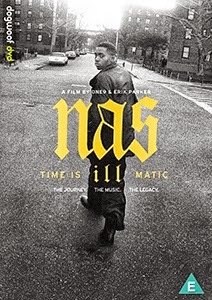 This is exactly where we are put with director One9’s Nas: Time Is Illmatic (2014). It has been twenty years since the emergence of Queens export Nas. Back in 1994, his debut album Illmatic, a commentary and exploration of the urban jungle and racial tensions just simmering under the surface, was met with critical acclaim. Here the lens is focused on what shaped Nas to become the game-changing MC he was by the time 1994 rolled around. At the time of its release, Illmatic was hailed as a classic of the hip-hop genre, earning the highest rewards and ratings from critics and fans alike. Time Is Illmatic mixes the lasting impact of the album while starting from the beginning, tracing Nas’ childhood, his home life and the politics of the urban black community he lived in to help better contextualize what made his first record such a paradigm-shifting album. Time Is Illmatic moves briskly through the Nas’ origins. A handful of minutes is given to each of the seminal moments in the artist’s life, keeping the pace clipped, but sometimes risking detours into befuddlement. As a result, viewers are taken in closely to the action, but left wondering: do we truly get to the heart of the man? Nas himself is captivating to watch: articulate, passionate and occasionally humorous, the films lays bare the storyteller persona he has been given over these past two decades. His life provides a rare window into racial politics and the trials and tribulations of urban life in the 1980s and 1990s. There’s a weak portrait being painted of the person behind the public image, though, and it leaves the documentary lacking overall. Contributing stories from friends and colleagues are hardly well-used; they can appear trite or disingenuous. But for all its shortcomings, there power and rhythm of Time Is Illmatic cannot be escaped. Highly evocative of a byegone era, it simmers with the memories of an time when escape from ones circumstances lingered just outside reach, where clashes of will were all too prevalent and when it felt exciting to be at the beginning of a new movement in music. The film seems to have been made in the image of Nas himself: aloof, poetic and a figurehead of power.